Wake Up Weekend 2007: Official Schedule! 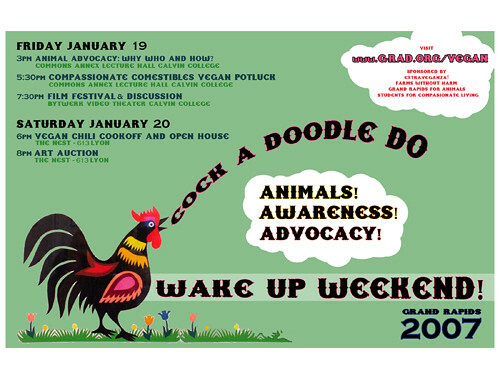 A weekend of animal-friendly food, art, education, and advocacy brought to you by ExtraVEGANza!, G-RAD, Grand Rapids For Animals, Farms Without Harm, and Calvin Students For Compassionate Living. 3:00-5:00 pm–Animal Advocacy: Why, Who, and How? Presentations by Harold Brown (Farm Sanctuary), Adam Durand (Compassionate Consumers), Nicole Matthews (PETA), and Nathan Runkle (Mercy For Animals). Have brunch and meet our special guests! Guest judges Harold Brown, Marie Catrib, Adam Durand, Nicole Matthews, and Nathan Runkle. Proceeds will benefit Farm Sanctuary, Mercy For Animals, and Compassionate Consumers. Artists with work up for auction include Sue Coe, Peter Brant, Kevin Buist, Jeremy Chen, Juan Garcia, Erika Jane, and Reb Roberts. For a complete list of contributors, contact Adam Wolpa (wolpa@calvin.edu).